The black 4 x 3.5" Bay SAS/SATA 6.0 Gb/s eSATA Hot-Swap Enclosure from iStarUSA is an external 4-bay SAS/ SATA disk array storage tower. 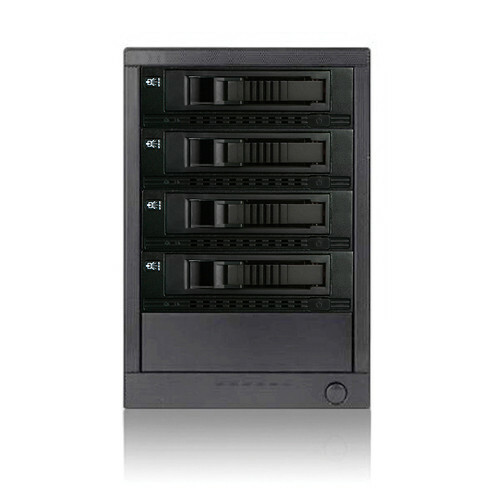 It provides storage capacity for up to 4 hard drives for RAID configuration in a compact design. This external tower is designed with 4 x eSATA connectors and features an 80mm ball bearing cooling fan that offers a long-lasting and enhanced thermal cooling solution. Number of Bays 4 x 3.5"
Box Dimensions (LxWxH) 19.0 x 15.0 x 12.0"